Sturgeon have lived in the Great Lakes longer than humans have walked the earth. But the ancient fish now need our help to stay here. A joint project by the federal and state officials with a Native American tribe is trying to do that by rebuilding habitat for lake sturgeon in the Kalamazoo River. WMUK’s Brian Petersen went along to find out how it’s done. It’s a sunny spring morning as Kregg Smith’s boat heads toward Lake Michigan from Saugatuck on the Kalamazoo River. Smith is the DNR fisheries biologist leading the sturgeon recovery project. Also aboard are Tanner Sommerfeld from the DNR and Jason Lorenz of the Gun Lake Band of Potawatomi. Smith guides the boat over to a gill net the three set the night before. The three hope they will find a few mature adult lake sturgeon heading up the river to spawn. Overfishing, habitat loss, PCB contamination, and dam building on the Kalamazoo River all contributed to the decline of the lake sturgeon population. And Kregg Smith says there’s also another problem: “The DNR has found that there is adequate habitat for feeding and forage. What is limiting the population is spawning habitat.” Sturgeon need cobble stones, rock and sand on the river bottom where females lay their eggs. But there are fewer places like that on the Kalamazoo River now. The restoration project is trying to reconstruct them. Binonemi-Smith and the Gun Lake Tribe have applied for federal funding that they would use in conjunction with the DNR and other partners to create new spawning grounds. But she says the tribe will continue with the project even if the grant money doesn’t come through. Binonemi-Smith says the Kalamazoo River sturgeon restoration effort is unique in the state because it involves tribal, state, and federal resources. Kregg Smith says bringing the sturgeon population back will take time. That's because lake sturgeon females only spawn once in every four to seven years. Females don't become sexually mature until they are 22 years old; males reach maturity in ten years. 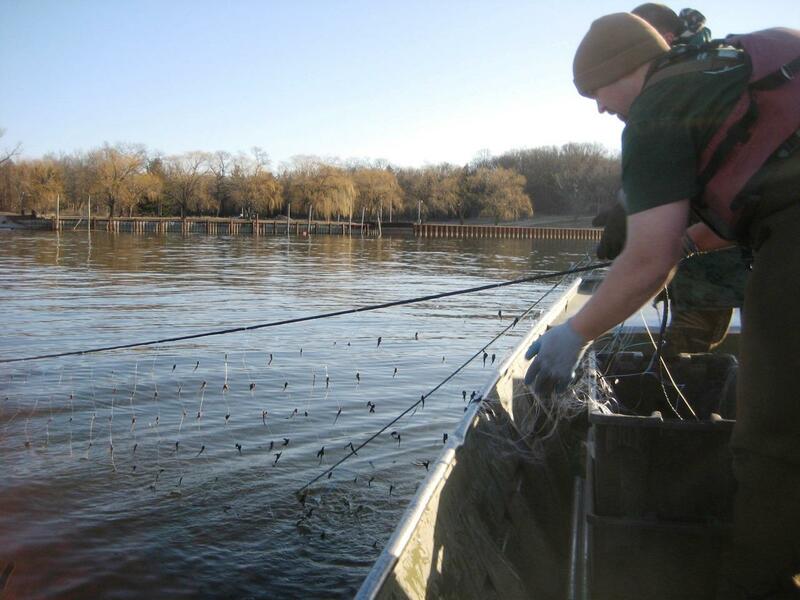 The DNR and other organizations collect naturally spawned sturgeon eggs and larval fish each May and take them to a riverbank facility where they grow and mature over the summer. They’re released back into the river in September. 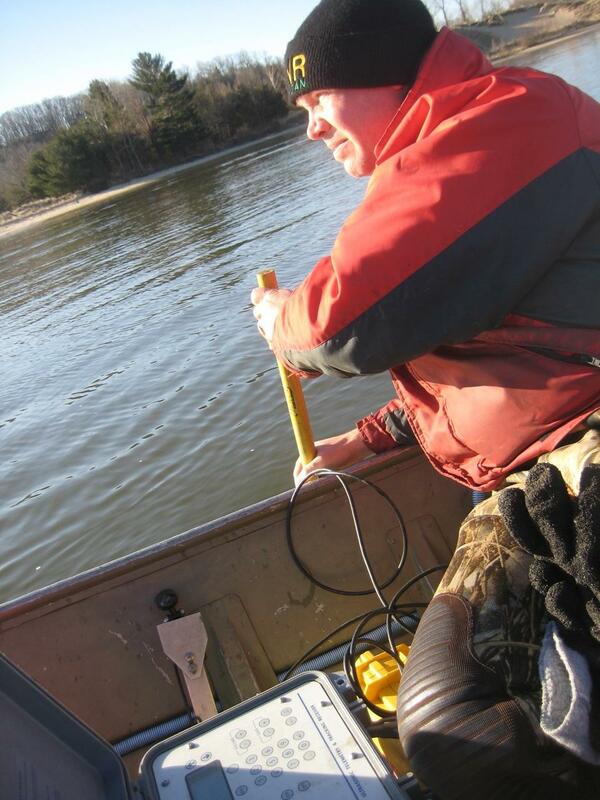 Biologists track adult sturgeon using tiny waterproof transmitters, when they can catch them. This time, Sommerfeld and Lorenz don’t find any lake sturgeon in their gill nets so Smith uses a hand-held receiver to scan for fish caught earlier. He doesn't find any. After ten years trying to restore lake sturgeon, Smith and his colleagues have spent countless days on the Kalamazoo River. But if their efforts are successful, their trips will no longer be necessary.